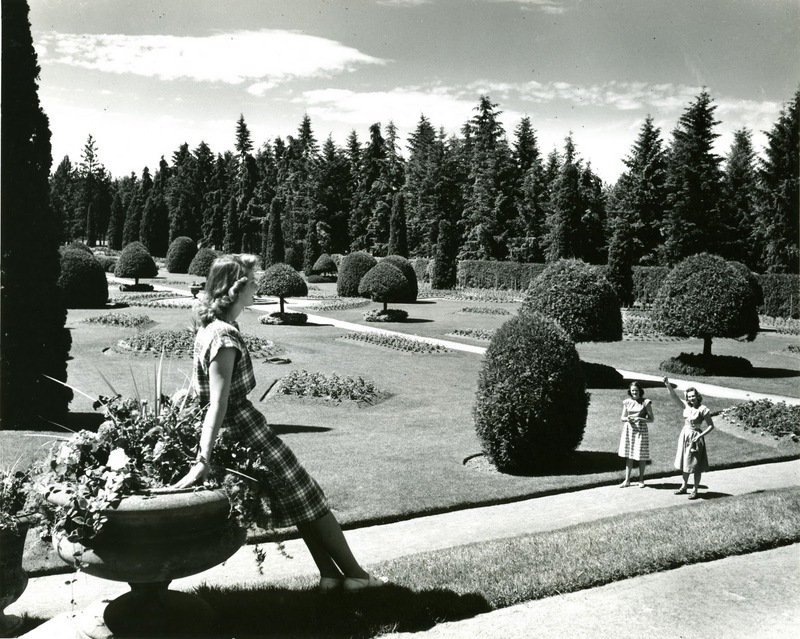 The main entrance to Manito Park is now at 18th and Grand, but in earlier years the entrance was at 20th and Grand. 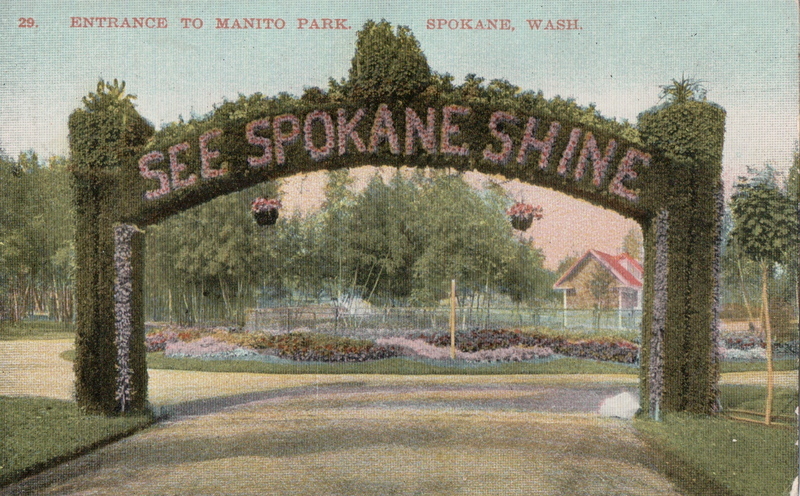 While today the area is green with grass and shaded by a few trees, in the first years of the twentieth century the "See Spokane Shine" archway made of hedge and flowers greeted visitors. Go stand at the corner of 20th and Grand, look into the park, and imagine what it would have looked like then. There would be a graveled walk, a couple of street lights, and you would see the Balzer's house in the distance. There would be landscaping with flowers and you may even see a few people sprinkled along the sides of the path eating their picnic lunches. Postcard - Entrance to Manito Park Spokane, Wash. Circa 1905: Image from the Ray Fisher Postcard Collection, Northwest Room, Spokane Public Library, Spokane, WA. 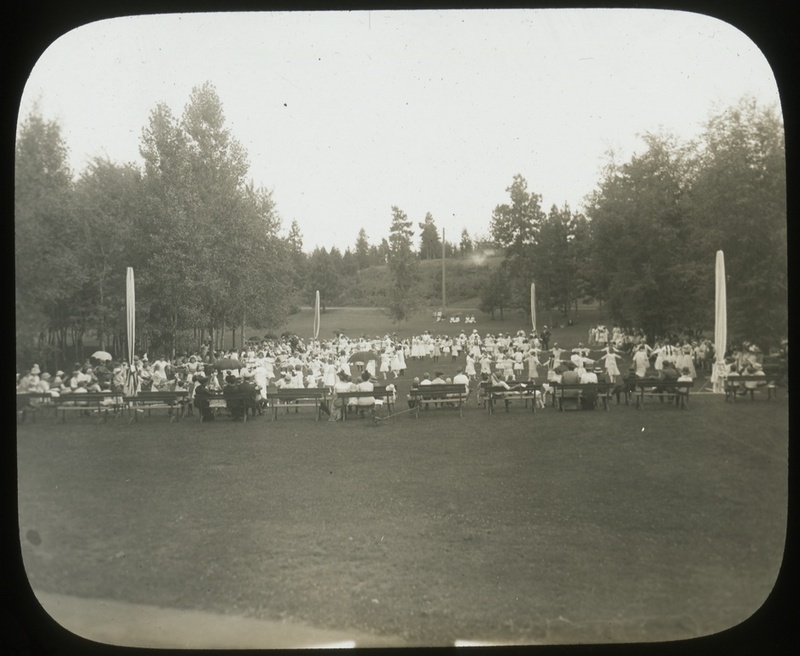 Concert at Manito circa 1907: Image from the glass plate negatives part of the Spokane Parks and Recreation Department, accessed courtesy of Tony and Suzanne Bamonte, Spokane, WA. 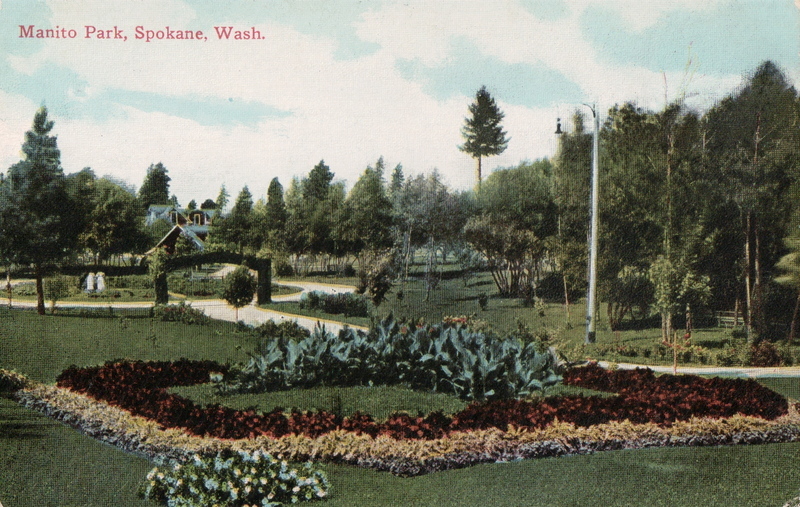 Postcard - Manito Park, Spokane, Wash. circa 1905: Image from the Ray Fisher Postcard Collection, Northwest Room, Spokane Public Library, Spokane, WA. Tracy L. Rebstock, “20th Street Entrance,” Spokane Historical, accessed April 24, 2019, https://spokanehistorical.org/items/show/115. 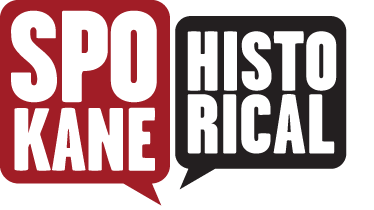 Tony and Suzanne Bamonte, Manito Park: A Reflection of Spokane's Past (book) 1998, Spokane, WA; Manito Park - Spokane Parks and Recreation Papers, City Hall, Spokane, Wa. City of Spokane Parks and Recreation Papers, Eastern Regional Branch, Washington State Archives, Cheney, WA; Manito Park - Vertical File, Northwest Room, Spokane Public Library, Spokane, WA. Manito Park - Vertical File, Northwest Museum of Arts and Culture, Spokane, WA. Jim Kershner, "At 100 with Nature," Spokesman Review, May 16, 2004, Lee Sahlin (1990) To Manitou, Northwest Room, Spokane Public Library, Spokane, WA. A Walking Tour of Manito Park by the City of Spokane Parks and Recreation Department and the Friends of Manito Park, 2010.